TS SET Answer Key 2019 – The Osmania University will release the TS State Eligibility Test Answer Key 2019 after the exam at telanganaset.org. The answer key will be released for the examination to be held on July 05, 06, 08, 2019. The candidates who will appear in the examination will be able to check the answer ket. As of now, the answer key releasing method is not known, the university may release the answer key in the form of login or pdf. At first, the provisional answer key will be released, then after considering the objection, it will release the final TS SET 2019 Answer Key. Get here all the details of TS SET Answer Key 2019. As of now, the university has not revealed any firm date for releasing of answer key. As soon as the University disclose anything about releasing of answer key we will update the same here. 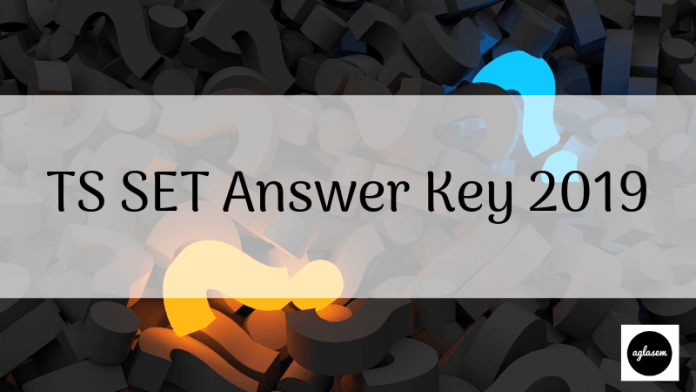 How To Download TS SET Answer Key 2019? After the successful completion of the exam, the TS SET Answer will be released. The candidates who will have appeared in the exam will be able to check it. there are two possible methods from which the answer key for TS SET 2019 can get released, either university will release it through the login, or via pdf file format. The candidates can check the methods to fetch the answer key which has been provided below. As TS SET will be held for 29 subjects and there will be a common paper for all, hence here 30 links of answer key will be provided, including the elective subject and common one. The candidate has to click on the link for the exam he /she will appear. On clicking the link, the pdf file will open. Now the candidate can check the answers. If the answer key gets released through the login, then it is sorted. The following steps will help in downloading the answer key. Click on the above link, which will redirect to the login window. Thereafter the candidates will be asked to enter the login credentials received at the time of registration. On entering the login credentials the answer key will be open in a new window. Now candidates can check the answer key. How to Calculate the Marks with TS SET Answer Key 2019? For each correct answer, 02 marks will be rewarded. For the incorrect answer, neither any marks will be rewarded nor deducted. For the unanswered question, there will not be an assignment of the marks. How to Raise The Objection on TS SET Answer Key 2019? In the official brochure their is no information about the answer key of TS SET. After the releasing of the answer key, the University will reveal the method for raising the objection. Till then the candidates have to wait for any official confirmation about the objection raising procedure. After the assessment of objections raised by the candidates, the University will compile the answer key and will release on the official website. The candidates have to download the answer key and calculate the marks. On the basis of final answer key, the result of TS SET 2019 will be declared.